Henryk Bronislaw Stenzel is an outstanding geologist, teacher, and scholar. It is particularly appropriate that the Gulf Coast Section of SEPM add its recognition to Dr. Stenzel's other honors, because he has been studying and teaching in the Gulf Coast for more than 45 years. 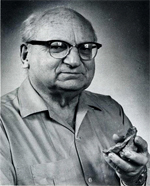 Perhaps it was inevitable that Henryk Stenzel become a stratigrapher and paleontologist, for as a child in Pabianice, Poland, where he was born in 1899, he played with Jurassic fossils in the creek beds near his home. However, at the Schlesische Friedrich Wilhelms Universitiit in Breslau, Silesia, his doctoral research under the supervision of Hans Cloos was on granite tectonics. When he arrived at College Station, Texas, on August 18, 1925, he found the granites of the Llano Uplift to be too far away to receive his continuous attention, so he began to concentrate on the closer-at­hand Claiborne section on the Brazos River. Confronted with the problem of deciphering stratigraphic successions in the flat-lying, soil-covered Texas Coastal Plain formations, he soon applied methods that had already earned him distinction as a young man in his hard-rock days: close observation; meticulous attention to detail; careful recording; logical analysis. To this day, he has found that these procedures serve him well. Since the day he began his studies of the Tertiary at Texas A&M, Dr. Stenzel has worked with intensity and creativity in the field, in the laboratory, and in the classroom. His many contributions to the solution of formation boundary problems, to paleoecology, and to the understanding of mol­luscan evolution have already been documented in the dedication to him of the 1965 volume of the G.C.A.G.S. Transactions. A most significant addition is his latest work, the volume on the oysters to be published this year as part of the Treatise on Invertebrate Paleontology. His earliest Gulf Coast publication, on the Claiborne, appeared 40 years ago. The intervening years have been filled with challenging responsibilities. In 1934, Dr. Stenzel left College Station to join the Texas Bureau of Economic Geology. He remained in Austin until 1954 (except for a brief period in 1937 as a "special problem" geologist with Shell Oil Company), successfully combining teaching with field work and research when he became Professor of Geology at the University of Texas in 1948. In the classroom he taught the same close observation, attention to detail, and logical reasoning that he applied in the field. In 1954, he left Austin to become Chairman of the Geology Department at the University of Houston, and Consultant to Shell De­velopment Company. A heart attack, suffered in 1957, forced him to resign from the University post. He resumed teaching in 1962 when he became a Visiting Lecturer at Rice University. Leav­ing Rice and Shell in 1967 to accept a Visiting Professorship at LSU, he has remained in Baton Rouge, where he was given his present title of "Consulting Professor" at the time of his mandatory retirement last year. It is difficult to single out a few of Dr. Stenzel's contributions and designate them as the most outstanding, but perhaps such a list should include (1) his surface mapping techniques which in­clude identification of formation contacts by vegetation, and recognition of disconformities, (2) his work on "successional speciation" in paleontology, and (3) his profound influence on several gen­erations of students who will remember how he taught them to observe, record, and interpret data. In conferring honorary membership on Henryk Bronislaw Stenzel in recognition of a long and distinguished career, and of his contributions to the principles of Gulf Coast stratigraphy and paleontology, the Gulf Coast Section, S.E.P.M. brings distinction to itself; and Dr. Stenzel honors us by accepting.